And we at AquAid couldn’t agree more. For some of us we even got to play a small part in the Olympics in our own way. Sure we didn’t get to compete, judge or cheer from the stadiums. But we got to experience the vibe, walk amongst some great athletes and in one very special moment, we even managed to adopt our very own world famous delivery driver…..even if it was for only a minute. 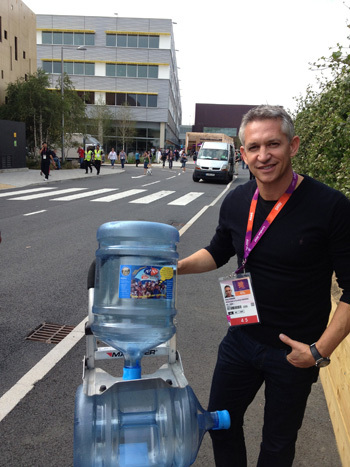 In the true spirit of the Olympics, Gary Lineker, one of the most iconic sports stars in the UK took the role of an AquAid delivery driver hard at work. Lord Coe said Britain should be proud of the London Games. We at AquAid are proud in the role we took in keeping Britain hydrated!